I am using a 1200gph pump in the sump connected to the new & improved SCWD. The output alternates between 2 custom built spraybars. One top mounted just below the surface of the water and one near the bottom behind the rocks. The overall effect from the alternating flow is more than I expected. I get some pretty good wave action on the yellow polyps, green star polyps and plate. There is also periods of hi flow to the Gorgo. I paid particular attention to the flow in the tank when positioning the corals. I am happy with the overall layout but the positions were largely dictated by the needs of the inverts and where the best flow was occurring in the tank. With the alternating current the tank rolls over from the top down the front for about 90 seconds and then reverses to hit the back of the rock work as well as come out strong by the gorgo in the lower right. It has been running since early September so it is still quite new. Although much of the LR and corals were from my smaller established reef so It is quite stable at this point. But I don’t have any plans to add further circulation to the tank at this time. It was a while in planning. Here is the scwd and sump. The scwd is a Switch Current Water Director that uses flow from the pump to operate. The original model was 3/4" adapters and sealed shut. It was hard to keep clean and did not handle flow well. The new scwd needs a minimum of around 1000 gph and can take much more than that. It has 1" adapters and a large body with a fully serviceable mechanism. Other gear drives can be ordered to change the switching rate. The total friction and head loss restrict flow almost enough for my standpipe and 1 ½" bulkhead to handle. I still have to throttle back the pump a bit with a ball valve. The return of my overflow and skimmer are going all the way to the far right of my sump so that the pump sits directly beneath the scwd. I did what I could to keep friction loss to a minimum with the elbows. 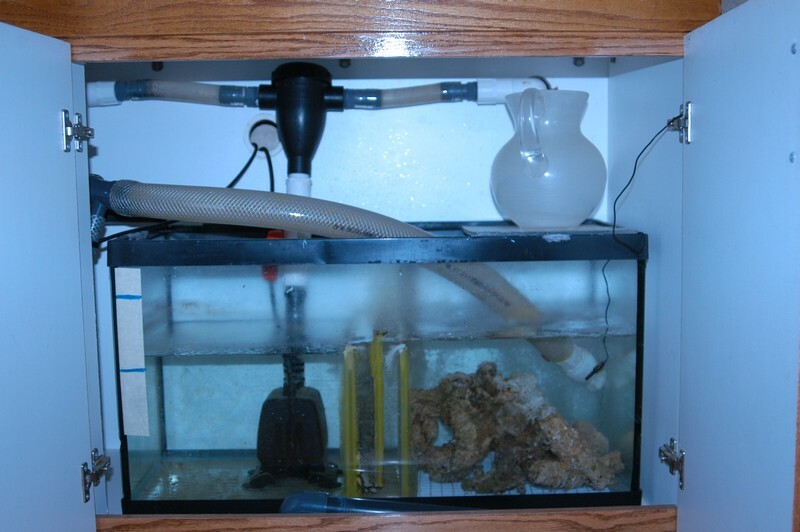 Everything you see heading out of the cabinet to and into the tank is 1" pvc. The skimmer is a DAS EX1. It is placed externally to keep it cleaner and make it easier to get out of the cabinet. Also I have such a small sump that I did not want to give up space for a skimmer. The sump is simply dived in ½ by a bubbletrap. One half houses spare rock and hopefully enhances the biological filter. I thought about lighting it but I figure with no light I will have less maintenance down there. Although I don't hold out much hope for pods or larva surviving the impeller sheer, I am sure the rock will breed quite a few in the dark. I have some bagged resin in the bubble trap to help clean up water quality as the tank matures. 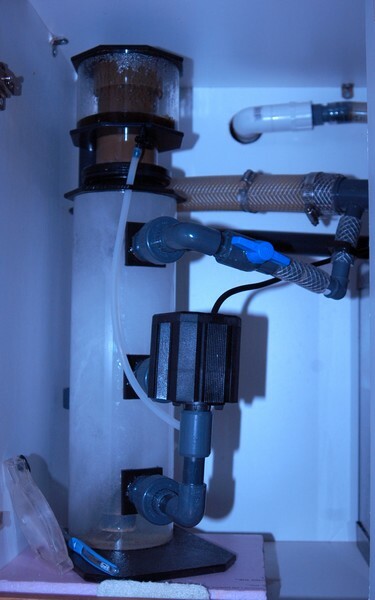 The other half is the pump reservoir that holds the ecoplus 1267gph pump. I like the look you have with the two separate towers. Are you using the 1" squid? I used the 3/4 on my old 90g. I never had a problem with it. Its only two months old so I guess it has not had time to get to dirty yet. And I have stuff laying all over the den insead of under my cabinet :b5: And yes that is the 1" scwd. I had to order it from the US. It is working well. Yes it is a red reef lobster. He has molted once so far and seems to get along with everyone pretty good. He has really made some big caves along the back of the rocks. But I put the rock on eggcrate before the substrate went in. And also epoxied much of it together. He is not going to know anything over. Nice layout Ken, I have been thinking of setting up something very similar to your setup. I have had a sump similar to yours setup on my ninety for about 6 yrs now and use some old underground filter plates as dividers,I use pairs of them tied together with the centre filled with very coarse crushed coral and will be adding a remote dsb between some of these. I also have almost 40 lbs of liverock in there as well and yes its getting tight especially if I add the remote dsb in future so I may use a larger sump. Very happy with the 1" SCWD Klaus. Still no issues with its operation. I don't consider the 3/4 to be as useful or reliable. This thing can handle upward of 3000 gph. It does not make a wave in the tank so much as it reverses or redirects the flow in you tank. Same thing as alternating powerhead controllers but it uses all the flow going through it. Alternating PH's redirect flow by shutting off. Where is the benefit in that? It is the sole source of flow in my 90 and supplies more than enough movement given the spraybar configuration. I would also caution that people need a sump designed to pass that much flow or run it on a closed loop.